The event started promptly at 8 a.m. on Saturday, May 16. Each of the 34 rookies participating in the 2009 NFL Rookie Premiere Photo Shoot at the Los Angeles Memorial Coliseum was pumped and ready to get down to business. And hand-selected members of Upper Deck’s Creative and Marketing teams were poised and prepared to capture all of the first-year up-and-comers in print and video. Seven photo/film stations were decorated across the western half of the coliseum’s football field, each created to deliver the players in various poses and moods that could be used in upcoming Upper Deck football card products. After all, this event represents the first time trading card companies can photograph the recently drafted players in their new professional team uniforms. Station No. 6 would quickly become the most anticipated station of them all, as players were asked to perform their very own “Touchdown Dance” celebrations on video. A vivacious touchdown dance/cheerleader instructor named Mary Riley was recruited by Upper Deck to provide inspiration and enthusiasm to get the players involved. And if all else failed, Upper Deck offered up a Michael Jordan-signed red Chicago Bulls jersey that would go to the winner (suggested retail price: $1,699.99)! Appropriately enough, No. 1 overall draft pick Matt Stafford (QB, Georgia) batted leadoff at Station 6, sporting his brand new, baby blue Detroit Lions uniform. He was joined by his two new Lions rookie teammates: Brandon Pettigrew (TE, Oklahoma State) and Derrick Williams (WR, Penn State). A personable, congenial rookie, Stafford provided yours truly with a quick, six-minute interview while his teammates joked to see who would perform their touchdown dance celebration first. Williams got the nod and quickly impressed a small group of onlookers who started to converge. Pettigrew followed and even incorporated “the lawnmower pull” as part of his repertoire. He then obliged Upper Deck’s video team and offered up his own interpretation of a touchdown dance. An original execution for sure, but probably not good enough to take top honors. “I gave it my best shot,” he said with a smile, before venturing off Station 7 to sign Upper Deck Authenticated memorabilia and dozens of autographs on various Upper Deck football cards to be used as inserts inside fast-approaching football products. A total of seven groups of players would pass through Upper Deck’s gauntlet of photo stations during the morning session (8 a.m. to 12 noon). Station 1 was positioned inside the Trojans locker room and had players posing against a white, seamless portrait-style background. Station 2 had the players posing inside the Coliseum’s lower tunnel; Station 3 would have the rookies standing with the upper tunnel feeding into the stands serving as the backdrop. Station 4 was a real sweat-buster for the players as they were instructed to get running starts and then fly through the air and land top of a port-a-pit, providing the photographer with the chanceto capture the player(s) in mid-air. Station 5 represented the “action photos on field” area where players would show off their pass-catching, pass-throwing and running capabilities. And then it was on to Station 6 and the touchdown-dance challenge. Station 1 would also be the location where players participated in Upper Deck’s newly unveiled virtual world for kids: UpperDeckU.com. When they weren’t being photographed, the players actually sat down and answered questions in real-time posed to them by kids across the county who had logged on. But it was the touchdown dance competition that kept people talking. When I informed USC QB Mark Sanchez the night before about Upper Deck’s TD Dance competition, he just looked at me and said, “I don’t dance. What am I gonna do?” I told him he’d dance on Saturday and that a Michael Jordan signed jersey was at stake. “Hmmm, maybe,” he said. When Sanchez’s two-man group came around on Saturday, which included New York Jets teammate Shonn Greene (RB, Iowa), he remembered our conversation and seemed genuinely excited. When he finished his interview, where he mentioned former Jets QB Brett Favre has always been one of his idols, he hurried over to the end zone and went right to work. 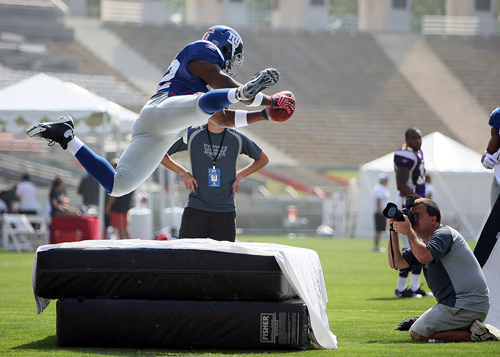 He even incorporated Greene to help him perform an end zone “football birth” for the competition. With Greene lying flat on his back with a towel strewn over his legs, Sanchez served as delivery doctor and – calling out QB-like signals – pulled a football from between Greene’s legs. The crowd went wild, right up until Sachez spiked the newly born baby football! “At least it was original,” said Sanchez. The remainder of the two sessions (morning and afternoon groups) would hold lots of laughs, original renditions and well-thought-out answers to questions about idols, goals and memories from their college careers. But once all the dust (and grass) had settled, it was Denver Broncos gregarious new recruit Knowshown Moreno (RB, Georgia) who walked away as Upper Deck’s first-ever Touchdown Dance Champion. Utilizing bits and pieces of what could have been four separate videos, Moreno was awarded top honors, which included a beautiful, laser-engraved crystallized trophy along with the coveted MJ-signed jersey. The film has been recorded. The shots are being screened. Now wait for Upper Deck’s newest football releases to find their way onto store shelves in mid July to see what I’ve described here. You won’t be disappointed. Fortunately, the video compilations should be done this week. Keep your eyes peeled for soon-to-be-uploaded links to see how much fun everybody had on May 16. It will be worth the wait. I promise. A Card Collector Goes Full Circle and is Hooked Back on the Hobby! Who Will Be Drafted First? 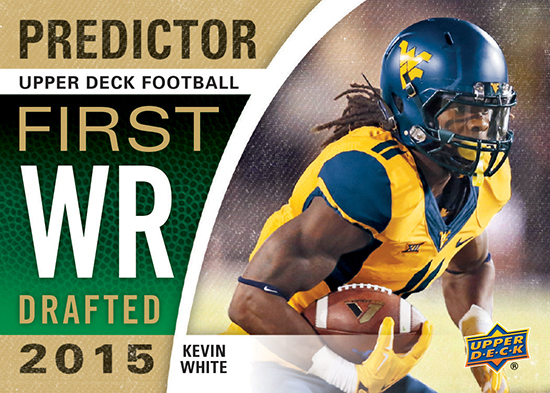 Upper Deck’s Football Predictor Cards are Back!